Its the rematch most BJJ practioners have waited a decade to see and tomorrow March 29th 2014 in Los Angeles California at the famed Peterson Automotive Museum, two legends take to the mat against each other since 2003 ADCC. 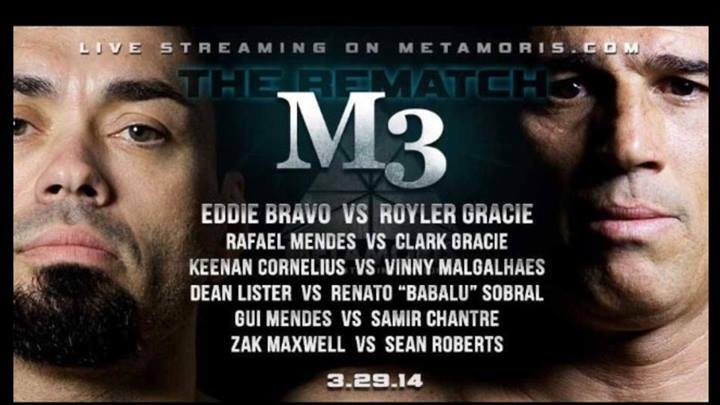 The two men in question are American Eddie Bravo vs Royler Gracie. Gracie the son of the legend that is Helio Gracie co founder with his older brother Carlos Gracie. The two brothers created a new art called Gracie jiujitsu what some refer to as Brazilian Jiujitsu or BJJ. To understand this match you have understand the Gracie legend, not one Gracie had been beaten in open mat competition, it was unheard of it would be akin to Pele missing a open goal in football, but in Abu Dhabi history would not repeat itself, in fact far from it a new name would be added to the already growing legacy that of Eddie Bravo the young American. Who had become vocal in in his quest to ditch the traditional Gi for what they called NO GI and Abu Dhabi was the place he was going to shine. For the first time in competition a Gracie would Tap, as Bravo and his new invention the rubber guard that would go on take Jiujitsu and MMA by storm, snapped in a tight triangle causing the undbeaten Royler for the first time to tap. And to wet your appetite here is the trailer.